In a fascinating alternate reality story of tiny accidents that cascade into cataclysmic disasters, writer/artist Alan Davis creates a world that never knew a Superman, and a Justice League that is about to face its greatest test of might and morality. All because of something as simple as a nail. Formed by the World's Greatest Heroes, the Justice League of America stands tall as the mightiest group of protectors Earth has to offer. Since the group's founding,one hero above all others has stood as their inspiration, guiding light and moral center: Superman. Now imagine a world without the Man of Steel. Welcome to the alternate history of JLA: THE NAIL. 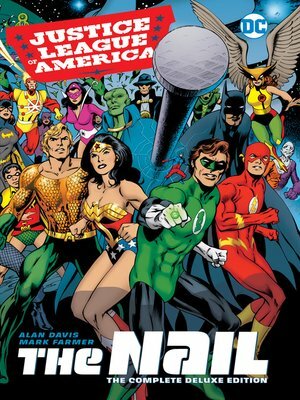 Collects JLA: THE NAIL #1-3 and JLA: ANOTHER NAIL #1-3.